Congratulations! You’re engaged, and you’ve probably already begun thinking about what you’ll want to wear on your big day. There are a lot of absurd rules about what brides should or should not wear to their wedding. On your day, you ought to feel confident in what you’re wearing and feel like you wearing it. You can go as out there or as conservative, as quirky or as traditional as you like. After all, it’s your wedding dress and it should feel made for you from head to toe. If you’re still unsure of what type of dress to go for and are looking for some guidance, we’ve put together our favourite alternative wedding dress ideas to give you some inspiration. Ball gowns and embellished wedding dresses can feel overly glitzy for some brides who want to stay away from an extravagant look. If you are looking for a romantic, delicate style that is not too fussy, then opt for dresses that embrace subtle detailing. Lace bridal tops with delicate patterns will add a romantic element to your dress. Flattering cap sleeve wedding dresses or gowns with longer sleeves can add a level of sophistication to your look, especially if the sleeves are made of lace, as this will allow you to pull off this style without feeling too covered up. Geometric lace patterns are a great modern alternative to the more vintage floral lace styles. Turn some heads by choosing a wedding dress that makes a statement. If a wedding gown with lace detailing is not the aesthetic you want to go for, why not consider a more stripped back style. A clean cut, simple dress in sensual silk offers you the perfect combination of elegant style and minimalistic design. Perfect for those brides looking for a modern dress that incorporates clean lines and expert cuts. If you are looking for a more low-key, simple style of wedding dress that oozes sophistication, why not consider a wedding suit dress instead of the traditional full-length gown? Perfect for city weddings or no-nonsense affairs, structured bridal dresses certainly make a power statement while also maintaining a minimal look. Choosing a simple yet sophisticated dress will help make you look glamorous and classy while staying away from the full-length styles. When you think of weddings, you tend to think of brides in a flowing white dress. But why should you follow conventions? If a day in a dress is not your thing, then a bridal jumpsuit might be the wedding outfit that you’re looking for. A wedding jumpsuit is a great alternative wedding outfit if a traditional gown feels too restrictive and formal for what you’re after. Plus, opting for a jumpsuit instead of a dress makes dancing the night away a lot easier! An aspect of bridal dress shopping that often gets neglected is considering how you can accessorise your dress. Bridal accessories like jewellery, jackets, capes, overskirts and veils can help to create multiple looks from one outfit. Accessorising your wedding gown also offers versatile options to add more personality to your bridal style. Whether you want to add vintage detailing through classic jewellery and embellished belts, or need a stylish but functional jacket to cover up for a religious ceremony, or want to add a flash of colour to your look. You are bound to find a bridal accessory or two to help you create a look that is truly your own. It can be easy to feel swayed by fashionable bridal styles, but while you want to look the part on your wedding, you also want to look like you. That’s why your wedding dress should embrace and accentuate your personality. While choosing a standard size or design can work for some brides, everyone is different. 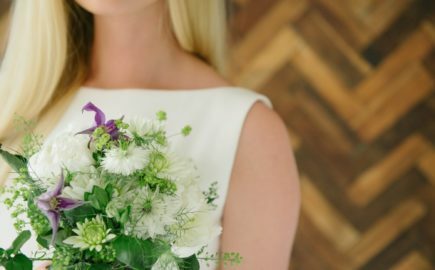 By opting for a made to measure or bespoke wedding dress, you can adjust a dress style that you love, or design your own tailored look from scratch to create the dress of your dreams. At Andrea Hawkes, we understand that your wedding dress is more than just a fashion display. Your dress should embody you and your personality, but also be comfortable and meet your requirements. That’s why we take a personal and thoughtful approach towards helping each bride find their dress. Book an appointment at our studio today to start your journey towards your perfect dress.